Notes: This will be performed as a group and will take no more than 15 minutes to perform. Individuals should perform the mobility drills that are best for their needs, if they do not know what to do, the coach will provide a drill. Notes: Remember, we want you to make contact with the bar at your hips EVERY REP! Perform the clean from the hang position if you are struggling with this part of the movement. 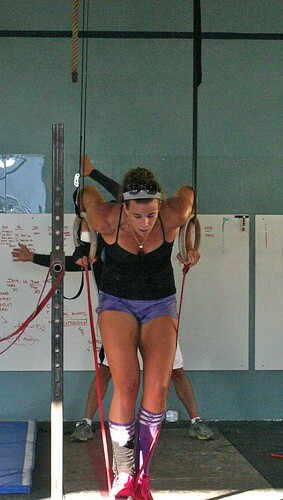 Scaling the dip on rings and bars: both working with an assistance band, working on maintaining a hollow body position and achieving good depth. Last week, I was pleased to have one of the members strike up a conversation with me about our programming and achieving their goal of losing weight. The conversation and questions raised were not new to my ears, but this particular conversation stimulated me differently. My breakdown of the conversation I had with this one particular member is summarized below, including my conclusion and new gym concept at the end! 2. When addressing any concerns about your progress in the gym, you must ask yourself these two questions: How do you move and Whats your diet look like? -This particular athlete I was speaking with moved very well, which led me to believe they could most likely improve something with their diet. This is not uncommon! Making changes to your diet are the number one way to see improvements in performance, body composition and your overall health. We cannot stress this enough! Your one hour in the gym is affected by the other 23 hours of activity throughout the day! We have our nutritional template as a jumping off point, in house produce delivery, wholesale grass-fed meat deliveries, recipes on our nutrition blog, regular Sunday Nutrition postings, varying nutrition challenges and coaches available to discuss your individual needs and questions. You must make this a priority if you want to see results!! -In my explanation of our programming, I caught myself when I said, “Our programming is designed to make you an athlete.” I thought about our hierarchy of athletic development, in which the base is nutrition, the next level is Metabolic Conditioning before moving into gymnastics, weightlifting and sport. What clicked for me here was thinking about the often addressed Intensity aspect of the workouts. We are always talking about scaling for intensity. Not sure what weight to do? Go lighter and faster: More intensity. However, there are certain movements that, even when scaled properly, are developing more of a neurological benefit than physiological benefit. While we know that this will help you to become a better overall athlete, I understand that certain athletes may need something different to accomplish their short term goals! -I thought about something that had happened earlier in this same day. A long time member that always scales the weighted movements down to keep up intensity, decided to use a heavier weight. We discussed the decision with class as “a necessary decision over time” and that he is giving this workout a “strength bias.” I all of a sudden realized that we don’t offer up a “conditioning bias” often enough! The idea was the same: change the workout to suit your needs and maintain the stimulus of the day! For example, certain athletes can receive a hell of a stimulus from toes to bar, but others, due to grip strength, body weight, midline strength, lack of coordination, do not receive the same stimulus! -I began to think about the recent Central Coast Clash competition, in which a couple of the girls did not want to perform the modified version of “The Kraken” because it was too modified and seemed too easy. Instead of toes to bar they did abmat situps, instead of box jumps it was step ups, instead of KB snatches it was DB snatches and the weights were all light. They ended up doing this super scaled version and guess what…it was absolutely brutal! They had no excuse to take a break, they had to keep moving because the movements were so easy. Their intensity was through the roof! The prescribed running distance is 800 meters on both ends with 75 wall balls at either 20 or 14lbs. For someone that is not a great runner, the 800 meter distance is going to be really slow, but just scaling it down to 400 meters might not be the answer. Maybe try 6 rounds of 200 meter run and 10 wall balls with a lighter ball. 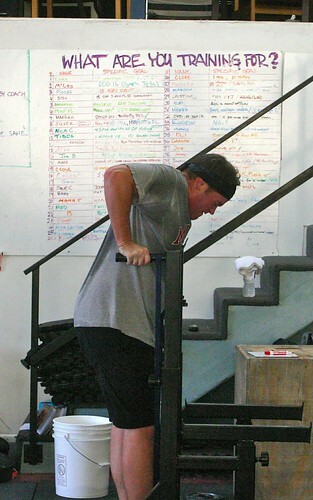 This way the athlete can keep their run pace higher and maybe go unbroken on the wall balls. The overall length of time for the workout would be similar. The movement stimulus would be maintained and their intensity would be much higher! My point of all this is that your personal Health and Fitness is a complicated beast. Our job is to create an environment in which you can thrive and focus on your individual needs. I want to encourage you all to discuss your thoughts, questions and concerns with me and the rest of the coaches as often as possible. We value your opinion and look forward to making changes that will allow you to accomplish your goals. Starting tomorrow we will be going through a trial phase of offering a “Conditioning Bias” version of the workout for those that are interested. We hope you enjoy!